Located along the banks of the west coast of Reunion Island, Le Récif offers an authentic experience of island life. 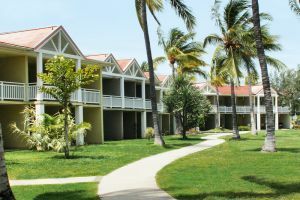 The 3-star hotel, with a unique fusion of authentic Creole and elegant colonial architecture, nestled in three acres of lush gardens coaxed by flowers and trees offering a refreshing atmosphere while enjoying an exclusive view on the spectacular lagoon of l’Hermitage. So take your time and let yourself be overwhelmed by the atmosphere of this hotel where every moment is an opportunity to experience the unforgettable. 51 Standard rooms with a surface area of 28m2 each. They are equipped with spacious double beds featuring a splendid wooden headboard, a writing desk and a comfortable sofa-bed. The rooms feature a French doors that lead onto a large terrace overlooking the landscaped gardens. The stylish bathroom features a shower, bathtubs and separate toilets. The Standard rooms can accommodate 2 adults and 1 child. Superior Room 63 Superior rooms, each with a surface area of 28m2. Ideal for families with children, guests may choose between twins, double or quadruple format beds, with the option of a sofa bed. The room features a terrace with deck chairs and the bathroom has a shower, a bathtub and separate toilets. The Superior rooms can accommodate 2 adults and a teenager or 2 children. 14 Family Superior Suites with a surface area of 60m2 composed of 2 interconnecting Superior rooms, perfect for larger families. The rooms feature king size beds, but can be configured to match your needs. The bathroom is equipped with shower, bathtubs and separate toilets. 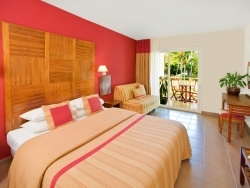 The Superior Family Suites can accommodate 4 adults and 3 children of less than 12 years old. 4 Junior Suites with a surface area of 72m2. They are housed in a separate villa on the seafront and have a large furnished balcony with killer views. The spacious room has a large double bed crowned by a lovely wooden headboard. The Suites feature a separate living area with a writing desk, television and comfortable colonial style furniture. The stonework bathroom completes the natural look and is equipped with shower, bathtubs and separate toilets. The Junior Suites can accommodate 2 adults and 1 child of less than 12 years old or a baby. 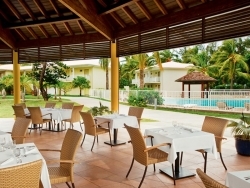 The main restaurant, Le Maloya, invites to experience the cooking tradition across the Indian Ocean. It is the place to gather or a hearty breakfast or a lazy lunch al fresco style. For dinner it proposes a festive themed buffet to enjoy the flavors of distant lands, accompanied by a local entertainment with musicians and dancers. For those lazy mornings where you just can't find any reason to crawl out from under the covers, enjoy a late breakfast overlooking the pool at Comptoir Sud’s pool bar. 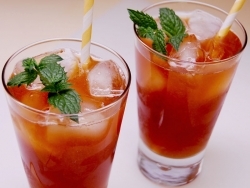 Delicious snacks are served throughout the day and in the evening a band invites you with a little salsa and some tango to enjoy the crimson sunset while you sip a stealthy fruit cocktail laced with rum. Others: Kids Club with a specialized animation’s team. * These informations are not contractual and may be subject to modifications.